Train, Advise, Assist Command - Air. TAAC-Air is a renamed NATC-A (see below). It has about 300 personnel based at Kabul and Kandahar. Read more about TAAC-Air. NATO Air Training Command - Afghanistan. Commonly referred to as NATC-A, this organization was composed of less than 1,000 personnel from a number of coalition countries. NATC-A was attempting to train up a fledgling Afghan Air Force so it could fill a capability gap caused by departing U.S. MEDEVAC helicopters and close air support aircraft. The mission remains the same until December 2017 when the current training and fielding plan for the AAF is complete. The NATC-A was commanded by BG John E. Michel (as of Sep 13 - see bio here). U.S. Air Force Air Advisors Academy. The Air Advisor Academy is located at Joint Base McGuire-Dix in Lakehurst, New Jersey. Many of the U.S. Air Force Advisors attend the academy prior to deployment to Afghanistan. 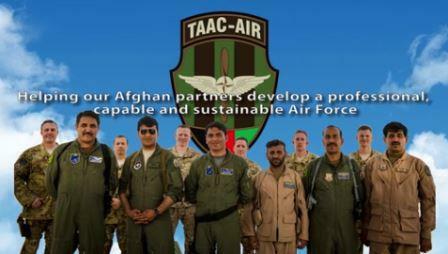 The advisor assignments are usually with the NATC-A (now called TAAC-Air); although some are assigned to the Afghan Hands program. Update: In July 2015 the Air Advisor Academy was shutdown. In an era of budget restraints something has to give so that the Air Force can buy the F-35 Lighting II. Numbers of Advisors. As of March 2015 there were "roughly 1,800 U.S. airmen" in Afghanistan. About ". . . 170 are directly involved with training, advising, and assisting the Afghan air force". 2. AFTTP 3-4.5 Air Advising. One of the Air Force's newest Tactics, Techniques and Procedures publications is utilized by air advisors. This publication provides guidance in training and in field operations. AFTTP 3-4.5 Air Advising is available for download on the Expeditionary Combat Support TTP respository. 1. April 11, 2019. "Afghans Take the Controls", DVIDS. A U.S. Army helicopter pilot, CWO2 William Knox of the 48th Infantry Brigade Combat Team, is the lead advisor for aviation to the 201st Selab Corps of the Afghan National Army. He is interviewed about his role as an advisor. September 26, 2016. "Dunford: US Air Force Should Incentivize Foreign Training Mission", Defense News. The Chairman of the Joint Chiefs of Staff calls the training of foreign allies a "core mission" of the US Air Force. November 3, 2015. "Cultural Gaps Cause Problems in U.S.-Afghan Military Ops", Iowa Public Radio. Lt Col Fielder, an air intelligence advisor to the AAF from October 2013 to December 2014 explains how knowledge of Afghan culture can enhance communication while advising. July 15, 2015. "TAAC-Air advisors provide C-130 medevac training to Afghan medics". U.S. Air Force. December 26, 2014. "Female aviator makes difference training Afghan AF". U.S. Air Force News. Maj Mary Clark spent year training pilots at Shindand Air Base. July 22, 2014. "A day in the life of combat aviation advisors", Special-Ops.org. A profile of air advisors of the U.S. Air Force 6th Special Operations Squadron. September 19, 2013. "Airmen will stay in Afghanistan for Resolute Support". Air Force Times. September 8, 2013. "Airmen help build Afghan Air Force: Focus is moving wounded troops to hospital". Air Force Times. An informative article about the efforts to have the C-208 carrying wounded to hospitals. August 1, 2013. "Air advising in retrospect". U.S. Air Force. July 31, 2013. "Face of Defense: Airman Advises Afghan Helicopter Maintainers". DoD. June 5, 2013. 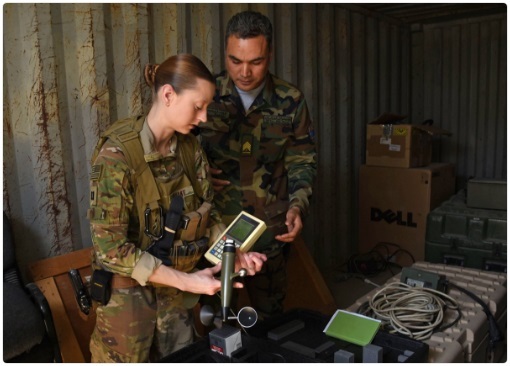 "Afghan squadron partners with 10th CAB". DVIDS. May 20, 2013. "Afghan pilots learn 101st air assault tactics". The Leaf Chronicle. Afghan helicopter pilots train at Bagram Air Field (BAF). April 23, 2013. 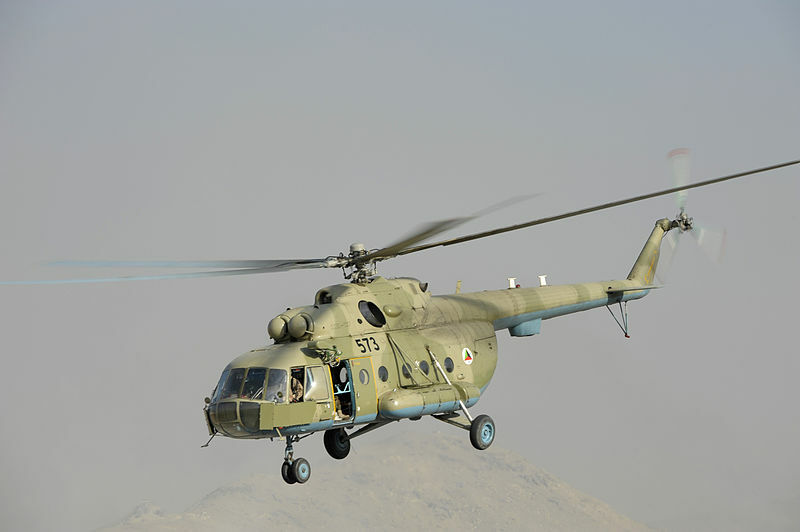 "NATO-Russia Council expands support to Afghan Air Force". NATO. New agreement will provide for more trained technicians for the Afghan Air Force. February 7, 2013. "Air Advisor students fly, fight, win". DVIDS. A news story about students with the Air Advisor Academy at Joint Base McGuire-Dix in Lakehurst, N.J.
May 1, 2010. "6th Special Operations Squadron". DefenseMediaNetwork. A profile of the squadron that provides air advisors worldwide. Douglas, Col Matthew A. (USAF) and Dr. Jonathan Ritschel, "Air Advising in Afghanistan: Building an Organization in Flight", Air & Space Power Journal, Fall 2018, pages 85-91. Tucker, Aaron and Aimal Pacha Sayedi, Advising the Afghan Air Force, National Defense University Press, January 1, 2016. This article breaks down the essential components of a successful air advising posture, applies it to the mission in Afghanistan, and concludes with a summary of key points and suggested areas for improvement. Bertnam, Ian. "Ancient Backbone: Using Ancient Texts to Train Modern Allies", Small Wars Journal, July 15, 2015. A Mi-17 Air Advisor in Afghanistan suggests some reading for advisors. RAND, Cost-Effective Helicopter Options for Partner Nations, RAND Corporation, April 2015. The Russian Mi-17 is compared with other similar helicopters. Keltz, Maj Gen Michael A. "Getting Our Partners Airborne: Training Air Advisors and Their Impact In-Theater", Air & Space Power Journal, May-June 2014. Rolleston, Mort, Lt Col Ric "Trimmy" Trimillos, and Tom Gill. "Aviation Security Cooperation", Air & Space Power Journal, September-October 2014, pages 92-107. Carrano, Eric. Making a Difference with Aviation Foreign Internal Defense, Naval Postgraduate School (NPS), Monterrey, CA: December 2012. Brozenick, Norman J., Another Way to Fight: Combat Aviation Advisory Operations, Air Force Fellows Program, Air University, Maxwell Air Force Base, Alabama, June 2002. April 30, 2016. 538th Air Expeditionary Squadron, DVIDSHUB.net, a 3-min long video about air advisors in Afghanistan. 2. For numbers of advisors as of March 2015 see "Afghans want U.S. to speed up training of Afghan air force", Air Force Times, March 26, 2015. 3. For news on the closing of the Air Advisor Academy see AAA consolidates expertise, training under EC, Air Forces News, July 14, 2015.